Posted May 9, 2017 in Featured Post, Tips, Tags: kidney diet strawberry recipes, potassium in strawberries, strawberries, strawberry nutrients, strawberry recipes by Michele Damon, RDN. With warmer weather on the horizon, I get excited about the coming gardening and growing season. I think of strawberries as the announcement of the warmer months to come. Strawberries are one of the first crops to arrive at local farmers’ markets. The taste of fresh local strawberries just can’t be beat. I always look forward to enjoying these wonderful late spring, early summer berries. Whether purchasing a quart or two at a local farm stand or spending an afternoon in the sun picking these ruby red gems, you are sure to enjoy them. You can find local farm stands and pick your own farms in your area by visiting the USDA national farmer’s market directory . You can search this site by state or zip code to find a farmer’s market close by. 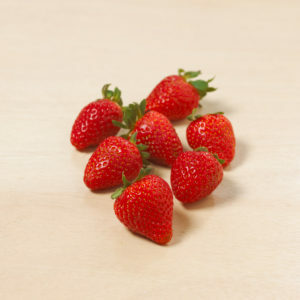 You can also search by products available at the farmer’s market and look specifically for those selling strawberries. Some grocery stores sell locally grown strawberries. Strawberries are low in potassium and fit well in a kidney-friendly diet. One cup of whole strawberries has 220 mg potassium, 35 mg phosphorus, 46 calories, 11 g carbohydrate and almost 3 grams of fiber. You may be tempted to eat more of these tasty berries, so it’s best to measure the portion. 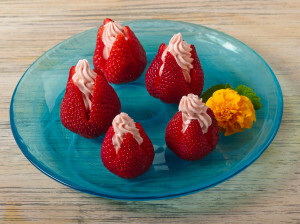 While they taste incredible on their own just washed and eaten plain, there are many ways to use strawberries. Here is a strawberry recipe collection which highlights strawberries as an ingredient. Check out this collection and try a few new recipes with fresh strawberries. And strawberries aren’t just for desserts; they can be incorporated into salads, blended into smoothies or baked into sweet bread as well. Check out the Today’s Kidney Diet Springtime Favorites cookbook on Davita.com. Always consult your dietitian or doctor for the specific diet that is right for you as kidney diet guidelines vary for each individual. Michele has been a dietitian since 2002. She enjoys vegetable gardening, cooking, trying new foods and ethnic restaurants. MIchele volunteers as a board member for her local farmers' market. 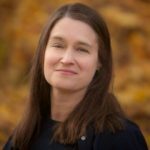 She also help with cooking demos and am passionate about having people try local foods, new foods and keeping farming in her home state, New Jersey.